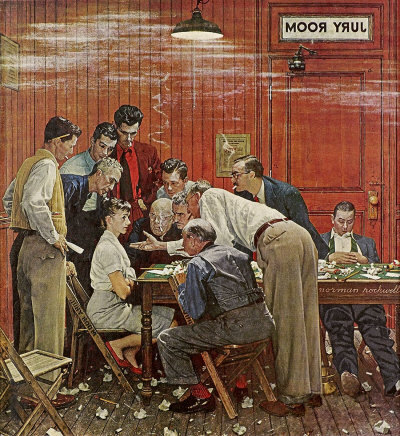 The Jury, a Norman Rockwell painting , appeared on the cover of The Saturday Evening Post published February 14, 1959. This is another timeless favorite of Rockwell collectors, a classic for all the ages. This painting was Rockwell's 304th overall out of 322 total paintings that were published on the cover of the Saturday Evening Post. Rockwell's career with the Post, spanning 47 years, began with his first cover illustration, Boy With Baby Carriage in 1916 and continued through his last, Portrait of John F. Kennedy, in 1963. This was also the first cover for The Post in 1959. In 1959, there were four Norman Rockwell Saturday Evening Post covers published. on page 222 of Norman Rockwell, A Definitive Catalogue by Laurie Norton Moffatt. Three studies is also reproduced on page 222 and 223 of the Norman Rockwell Catalogue. Norman Rockwell decided to tackle the judicial process in this painting. Ah, the smoke and tension filled jury room. Ah, the lone holdout juror. The lone holdout preventing a unanimous verdict is also the only woman. Apparently all of the male jurors have voted the same verdict. Drawing on all their powers of persuasion, they are trying to convince the lady to change her vote. She is having nothing of it. Her body language shows that she has made up her mind and is not changing her vote. I do not blame her. A jury can vote not just on the facts of the case, but also the law itself. It is her duty to vote her conscience, just as it is the duty of all jury members. The Jury was only one of 322 Norman Rockwell Saturday Evening Post covers; Here is the list of Norman Rockwell Saturday Evening Post cover illustrations. This is another self-portrait since we can see Rockwell painted himself as one of the jurors. We also see Louie Lamone, Rockwell's friend, confidant and assistant, in the red shirt and jacket. The female juror was modeled by Barbara Brooks. Her husband, Bob Brooks, was the model for the mustached man standing next to the sleeping juror. Do you know names of any of the other jurors? Do You Have A Great Story, Opinion Or Contribution About The Jury?